It is easy to get into a rut in the kitchen. From breakfast and lunch to dinner and snacks, we need to mix things up. Meal-kit services are so popular these days, so we wondered – what else could be delivered to our door? Greenblender sends you all the fresh ingredients for making five 2-serving smoothies. We shopped around and narrowed the (many!) choices down to these five companies, which specialize in make-at-home smoothies, wine by the glass, international snacks, creative burgers, and Italian foods. Read on to find out what we thought. 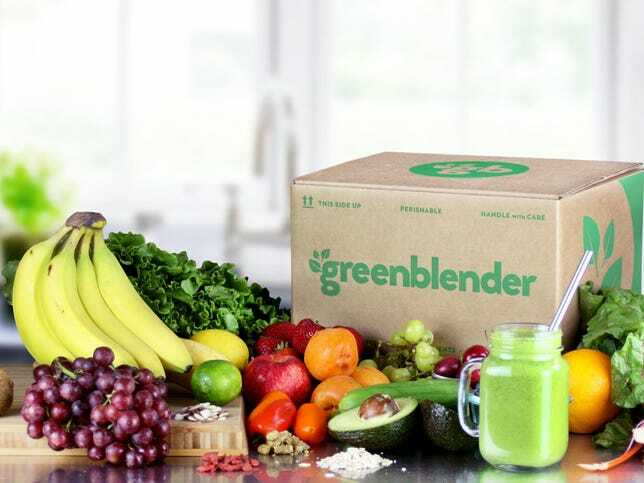 What it is: GreenBlender says they take all the hard stuff out of smoothie making (planning, shopping, measuring) and leave you with the best parts (blending and drinking). All the fresh ingredients for making five 2-serving smoothies are included in each box, with directions. How it works: Each week, you’ll get 5 new smoothie recipes and all the pre-portioned ingredients you’ll need to make 10 smoothies. The recipes are handcrafted to ensure they’re packed with flavor and nutrients. They say they only use the best produce and superfoods, and focus on working with organic and local farms. Who it’s good for: You like smoothies but hate buying all the veggies, fruit, herbs and other ingredients? This is for you. What we like: You don’t have to buy a whole bag of kale for one smoothie — just the right amount is sent to you. You get lots of variety and will get ingredients you never thought to try, but will love. And it makes it easy to whip up something healthy — and delicious. What we wish was different: It’s easy, but still requires prep time, chopping a little. And we recommend freezing that banana and fruit after it is delivered, so your smoothie is nice and creamy and frothy. How to get it: Visit GreenBlender.com. There are different subscription plans, with a weekly plan of 5 smoothies (10 servings) for $49. Vinebox, a wine-by-the-glass subscription service, come sin individual tubes. What it is: Vinebox is a wine-by-the-glass subscription service. Vinebox was founded by Matt Dukes and Rachel Vodofsky who wanted to find a way to bring sampling of small, European wine producers to the masses. They use a closed-nitrogen environment to prevent the wines from ever coming in contact with oxygen. The use of inert gas allows the wines to maintain their complete bouquet, flavor profile and mouthfeel throughout the fractionation process. Once the wine settles in its new home, it’s stable with no flaws, for up to three years. How it works: Three wines (glass-size servings) are delivered every month. This is not your standard wine club; it’s a new way to get wine. Pricing is $25/month (for annual subscription). 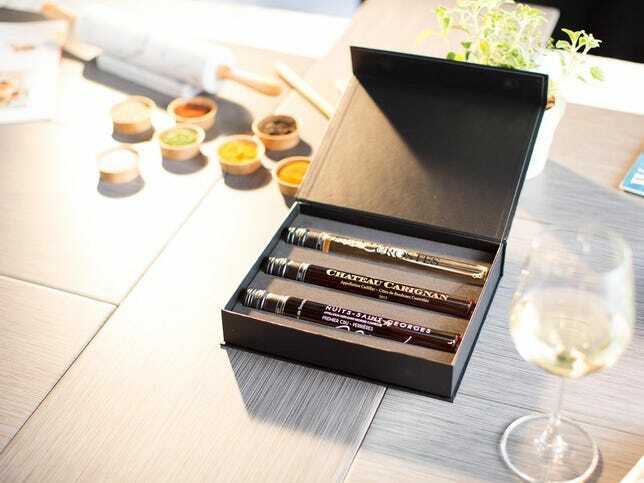 The wine comes in large, sealed test-tube like containers.You also can select to receive 6 glasses per month if you’re interested in sharing with your partner. What we like: The wine was wonderful. And so fun to receive the generous glass-size servings. And very fun to try each type of wine sent. You receive notes on each wine and recommended pairings. Who it’s good for: If you like trying new wine and good wine, this is for you. What we wish was different: These aren’t wines that are available at your local store. However, they do sell a selected amount of particular bottles on its website for customers to purchase. Not every wine is available for purchase in a bottle but is available for purchase in separate vials like the ones that come in the subscription box. How to get it: To order Vinebox, visit www.getvinebox.com. Depending on the subscription you choose, you can get three glasses of wine for $25 a month. And you can choose red only, white only or both. Munchpak delivers a variety of international snacks each month. 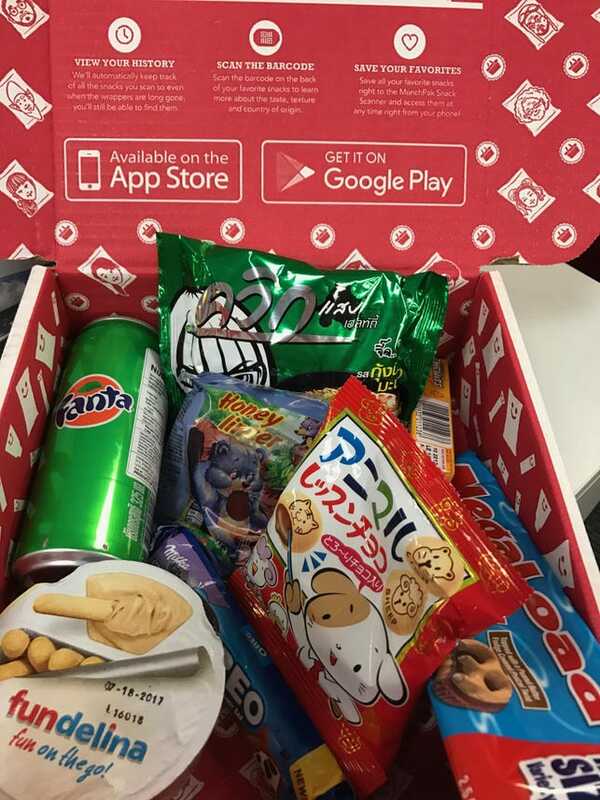 What it is: New and popular snacks from around the world delivered to you monthly. How it works: Each MunchPak Mini contains 5+ full-size snacks, the Original MunchPak contains 10+ full-size snacks and the FamilyPak contains 20+ full-size snacks. MunchPak imports snacks from all around the world. What we like: Every box is different, so it is always a fun mystery to see what’s inside. It definitely includes snacks you don’t often see or can’t buy in your neighborhood. Who it’s good for: If you like sweets — and sugar — and always want to try new candy — this is for you. What we wish was different: Many of the snacks were from foreign countries and labeled in a different language. We would have liked to know what was in these candies, especially for those of us with food allergies. How to get it: Visit Munchpak.com. A Munchpak Mini is 5+ full size snacks for $9.95 and different size Muchpaks are available. BurgaBox’s Hot Mess burger and garlic parmesan fries. How it works: Seven burgers are offered regularly, and shoppers choose the burger they want to cook. Varieties include The Texan Feast, which is topped with homemade chili, coleslaw, onions and cheddar; The Vermonster, topped with sautéed apples and red onion, bacon, maple mayo and sharp cheddar; and the Whiskey Tango Foxtrot, topped with mac and cheese, pulled pork, onion rings, BBQ sauce and pickles. Two burgers are included in each kit, as is a pound of fries — garlic Parmesan, Buffalo, chili, Cajun — and two pounds of macaroni and cheese. 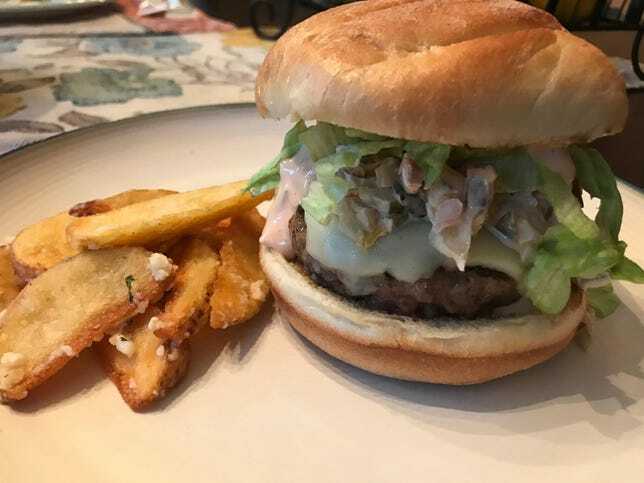 What we tried: The Hot Mess Kit: Beefy burgers topped with sweet potato fries, lettuce, cheese, Thousand Island dressing, and Hot Mess sauce; fries, and pulled pork-topped mac and cheese. The star was the Hot Mess sauce, which is spiked with jalapenos and bacon and is incredibly addictive. The burgers were meaty and juicy, the thick fries crisped up nicely and were tossed with a tasty combination of garlic and Parmesan — made even more delicious when pulled through the leftover Hot Mess sauce — and the pulled pork-topped mac and cheese was beyond indulgent. Who it’s good for: Burger lovers who want to cook but can’t be bothered with thinking up creative toppings, and healthy eaters looking for a cheat-worthy meal. What we wish was different: The price seems high — the kits cost $65 for two people and $75 for four — but they do include a large amount of food (In addition to the above, the kits also come with small containers of baked beans and coleslaw). The price is more attractive when ordered as a subscription; three- and six-month orders, which are on sale now, cost $177 and $354 (regularly $297 and $594). How to get it: Visit www.burgabox.com. 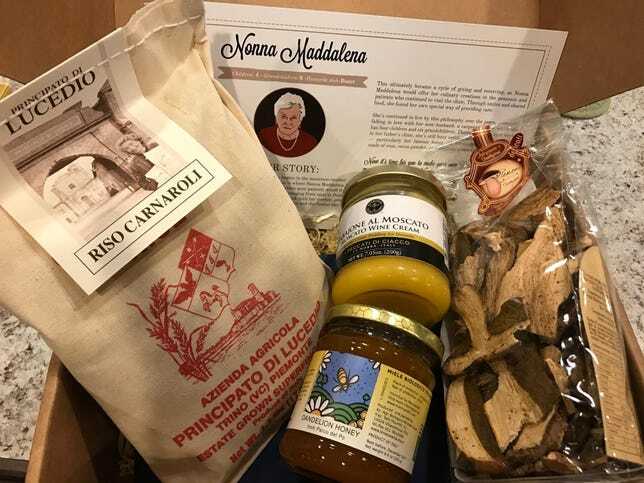 The contents of this Nonna Box came from Piedmont, in northeastern Italy. What it is: A monthly subscription that delivers six ingredients from a particular region in Italy, accompanied by information about the region; a letter from a nonna, or grandmother, from that part of the country; and a few of her favorite recipes. What we received: A box inspired by the foods of Piedmont, in northwest Italy. It contained fizzy elderflower soda, moscato dessert cream, corn cookies, dandelion honey, rice and dried porcini mushrooms. What we like: The detailed descriptions of and serving suggestions for each item; reading about an area of the country that was new to us; and reading the story of the nonna of the month. Who it’s good for: Home cooks who aren’t intimidated by unfamiliar ingredients and those with a feeling of wanderlust: sorting through the box makes you feel connected with a new place. How to get it: Visit http://www.nonnabox.com. The cost is $59.95 per month, $57.50 per month for three months, or $55 per month for six months.